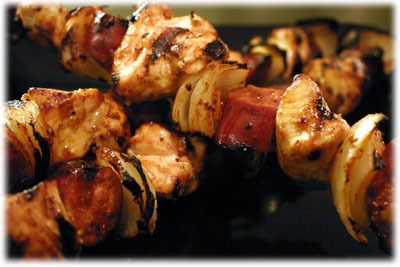 If you enjoy spicy grilled chicken recipes then these chicken kabobs are just for you. 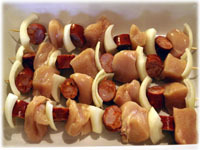 Thread boneless, skinless chicken on skewers with spanish onion and spicy spanish chorizo sausage before soaking them in a special spicy marinade recipe. This is not a "YEEOWW" sort of spicy hot, more of a nice long slow burn...and it's just like having a mixed grill on a stick! 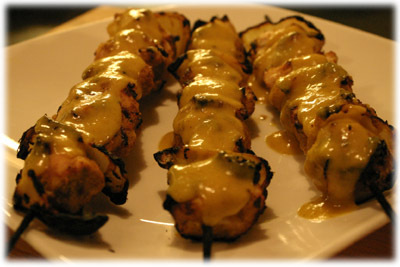 When grilling chicken kabobs there's always a tendancy to over-cook them and dry them out. These don't take very long at all, maybe 10-12 minutes at 550F, so check the internal temperature if you can and remove them when they hit 160F. There's not many chorizo sausage recipes that taste this good with chicken, with the exception of jambalaya, so I'm really happy with the way this one worked out. 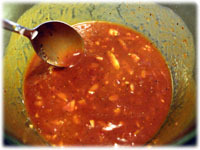 In a large glass bowl mix all of the marinade recipe, cover and set aside. 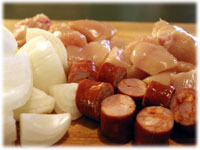 Cut the chicken breasts in half lengthwise and then cut into 8 similar sized chunks. You should have 16 chunks to make these kabobs. 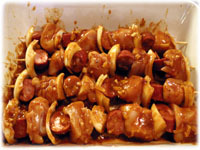 Cut the chorizo sausage into 16 chunks about 3/4" thick. Peel the spanish onion and then cut it in half, and then quarter the two halves. 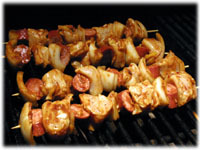 Thread a couple pieces of onion on a 12" bamboo skewer, then thread a piece of chicken, then thread a piece of chorizo sausage. Continue this pattern finishing off with a couple pieces of onion. 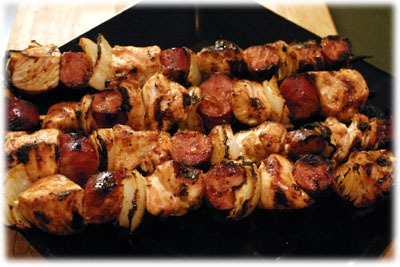 Place the kabobs in a shallow glass dish long enough so they sit flat on the bottom of the dish. Pour the marinade recipe over the kabobs. 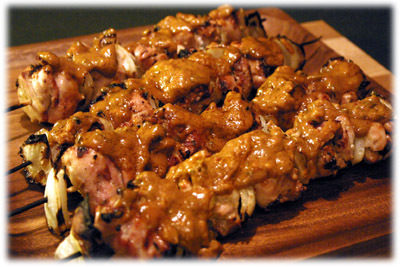 Spoon the sauce over the kabobs and keep turning them over so every surface is well covered with the marinade. Cover with plastic wrap and refrigerate the kabobs at least 8 hours for best results. Preheat your grill to 550F and oil the grates well with vegetable oil. This helps prevent the chicken from sticking. When the grill reaches cooking temperature place the chicken kabobs on the grill and close the cover. 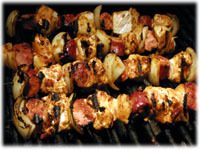 After 5 or 6 minutes check on the kabobs, gently "wiggle" them with your bbq tongs to release them from the grill. If they're showing nice grill marks flip them over and close the lid. After another 5 - 6 minutes check them again. With an instant read thermometer check the internal temperature of the largest chunk of chicken, just the meat, avoid touching the skewer. If it reads 160F then remove them from the grill to a serving platter and cover with aluminum foil. After sitting 5 minutes under foil the internal temperature should rise another 3 - 5 degrees. These are great served with cold salads and a rice side dish.